"Thank you – you guys are masters of the craft – loved the individual support and attention you provide as well as the opportunities to learn from other people on the course over the weekend. Felt very much treated as a friend rather than a client - thank you - really did learn loads." "I enjoyed the whole weekend. It was full of great tips and practical experience." "Thanks again for the weekend. It was a fantastic experience and inspiring to pursue the whole public speaking thing even further. I really feel more confident even in my personal life and it is easier for me, with the techniques you taught us, to push myself to a higher emotional level." "I'm just out of my presentation to the CIO and all of the VPs etc .... And, even if I do say so myself (and it isn't just me that's saying it), I totally nailed it!!!! I got 4 or 5 belly laughs, my pitch and passion came through, and only yesterday, I never thought I would ever say this, but I started to enjoy myself up there!!! With your help these past few weeks, I feel like I finally put some ghosts to rest!" "Speechcamp is a must for anybody who needs to or likes to engage in public speaking. 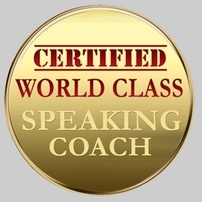 It is a fun way to learn or to improve the art of delivering a speech or a presentation. Speechcamp give the "keys" to unlock the door to a successful delivery. How to deal with nerves and fear and how to present your topic. It was amazing to see how the whole class improved at the end of the course. I would encourage anybody to take this course. It is beneficial for work and social occasions. It adds another string to your bow. Even if you consider yourself to be a good speaker come along for the polish! It is a life skill taught in a fun way by professionals." "I thank you deeply for helping me conquer my fear of public speaking. I attended the course because I was to be a best man for a friend of mine. For one year I had nightmares about the speech but thanks to the classes I began to relax and dare I say it began to enjoy speaking in public. My speech was better than expected and I cannot give you enough praise for the help you gave me."